So here we are again. We’ve avoided the post-apocalyptic nightmare of a Clinton defeat and trudge on to even more primaries that offer no concrete solutions to the 2008 Nomination War. This fight is going to rage until mid-June and for those of you who have stayed tuned to this blog, you know we’ve been saying this for months. A few things are clear from Texas and Ohio. Clinton avoided her Waterloo. Obama thwarted a sweep. And John McCain finally gained what was rightfully his for the past several weeks. The Clinton victories also mollified her supporters and donors who might have switched allegiances in the early morning hours on Wednesday. Under the banner of ‘party unity’, many of Clinton’s coterie would have denounced her if the junior Senator from Illinois had gained even one large state. Luckily, she won both and kept her organization afloat. Our projections show the most likely outcome of yesterday’s elections will be that Hillary Clinton gained 187 delegates, and we gained 183. 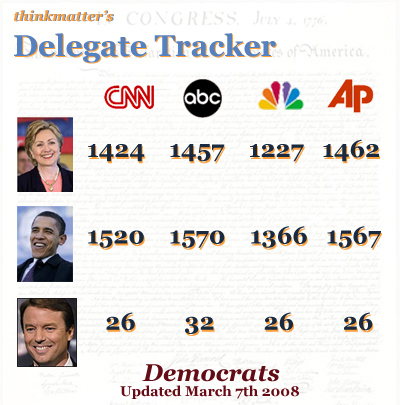 That’s a net gain of 4 delegates out of more than 370 delegates available from all the states that voted. While the press might disagree with the math, it’s hard to disagree with another of his conclusions – she’s trailing, and badly. The task for the Clinton campaign yesterday was clear. In order to have a plausible path to the nomination, they needed to score huge delegate victories and cut into our lead. It’s clear, though, that Senator Clinton wants to continue an increasingly desperate, increasingly negative — and increasingly expensive — campaign to tear us down. He’s firing back and he has the dangerous weapon of logic on his side. 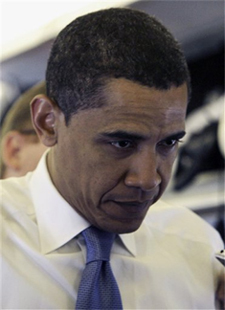 Not only is Barack saying that Hillary is going to have to claw victory from the undesirable position of having won fewer states and possessing fewer delegates, he has also planted the thought that if this primary season grows acrimonious, voters are going to grow weary. Watch for Obama to capitalize on this sentiment if this fight goes further than April. Please also note that the Delegate Tracker is now updated and reflects the returns from the Texas Primary & Caucus, as well as the 4 major news sources finally getting it all in print. I have decided to do away with the Republican Tracker, as we all know who the nominee is. Enjoy. Thanks for the tracker. Watching form the UK this is very useful especially once we’ve got round the super-delegate issue. Another Great write up, I will be sure to save this in my Furl account. Have a great evening.